Dominic has finally learned … make something cool, take a photo. Even better, take photos of the process. Without any prompting he sent me photos of the shelves he made. And they’re fabulous! We’ve got a set in our master bathroom and another in the living room and soon, he’ll be following the same process for a HUGE picture frame in our upstairs hallway. 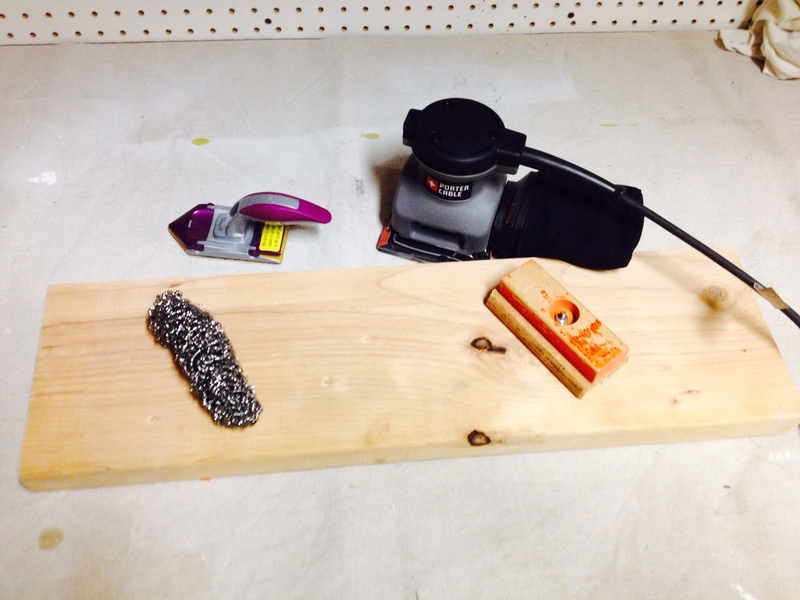 So, without further ado, in honor of Father’s Day, That Dad Dominic is here to share an easy little shelf DIY. 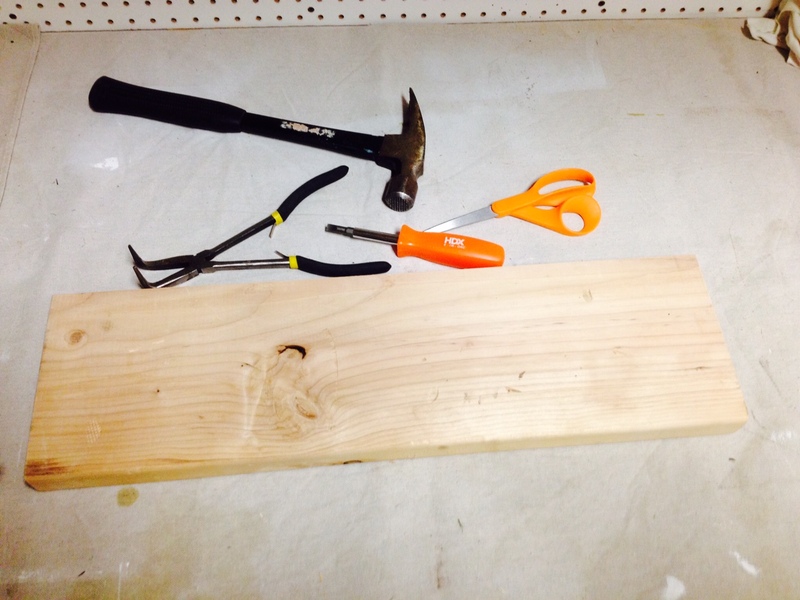 Start with a 2×12 piece of hemlock/fir and rip into your desired shelf width and then cut to your final dimensions. Our final shelf size was 7×24 inches. 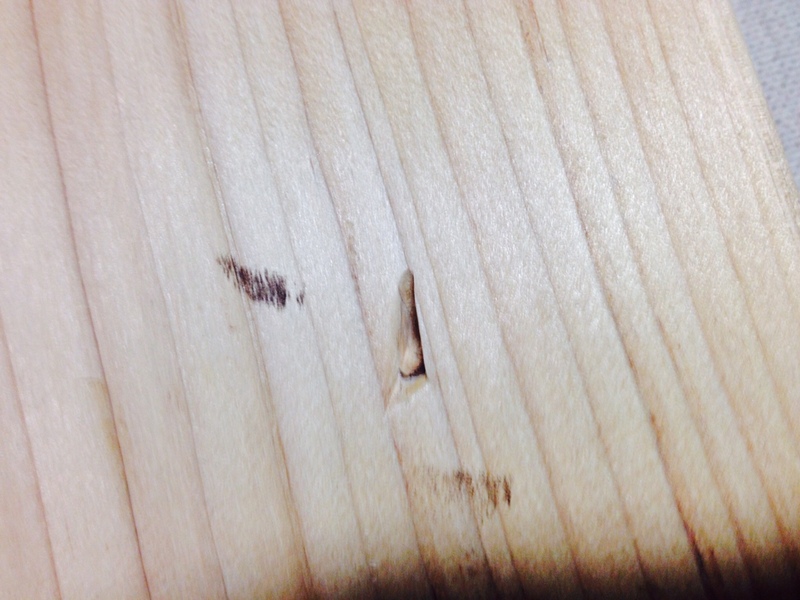 Begin distressing your pieces. We used a combination of a hammer, screwdriver and a sander to achieve a rustic, barn look. After distressing we sanded the edges to round the corners and all the surfaces for a smooth, final finish. That Dad Dominic Tip: The more smooth you get it here, the smoother your final shelf will be. Take the time to do it right! Lay out a drop cloth on your work space. Put on gloves because this stain, stains. Stain the top and sides of each piece with your foam brush, allow to soak in for 1-2 minutes, wipe off excess with cloth and allow to dry overnight. 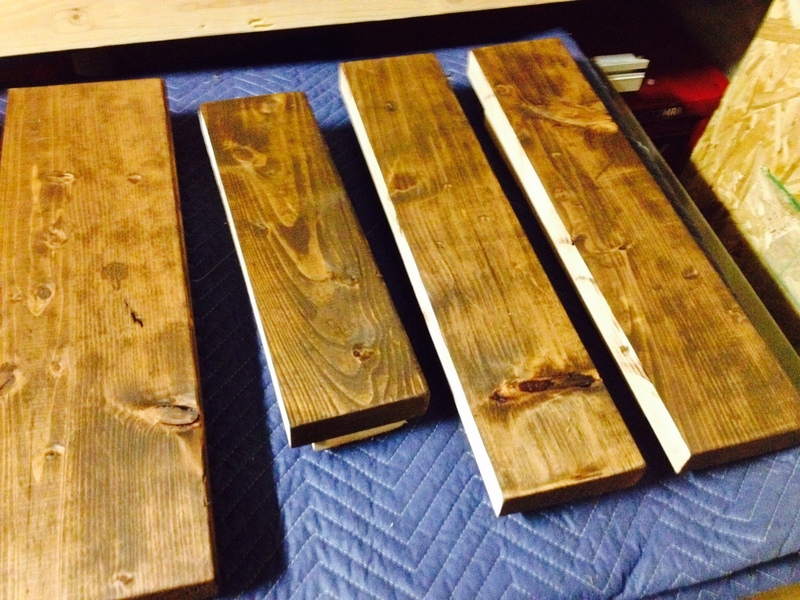 The next day, flip your piece over and repeat – foam brush on stain, wipe off and allow to dry overnight. If you want the stain to appear darker, just allow it to soak in longer which will result in less excess to wipe off. To save yourself some time/headache you don’t need to stain the back because that is the side that will be screwed into the wall. Within 2 days your stain will be dry. 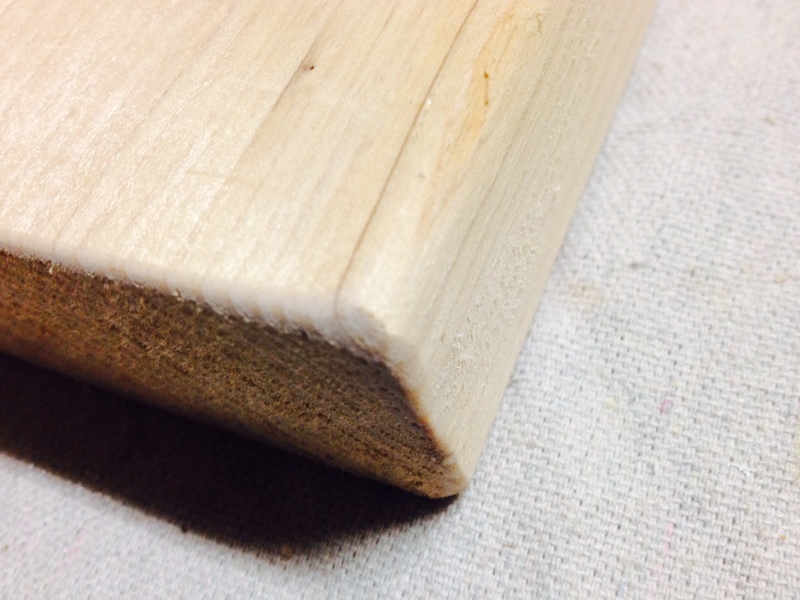 Lightly sand with fine sand paper for a smooth surface. Now it’s time to add the polyurethane. 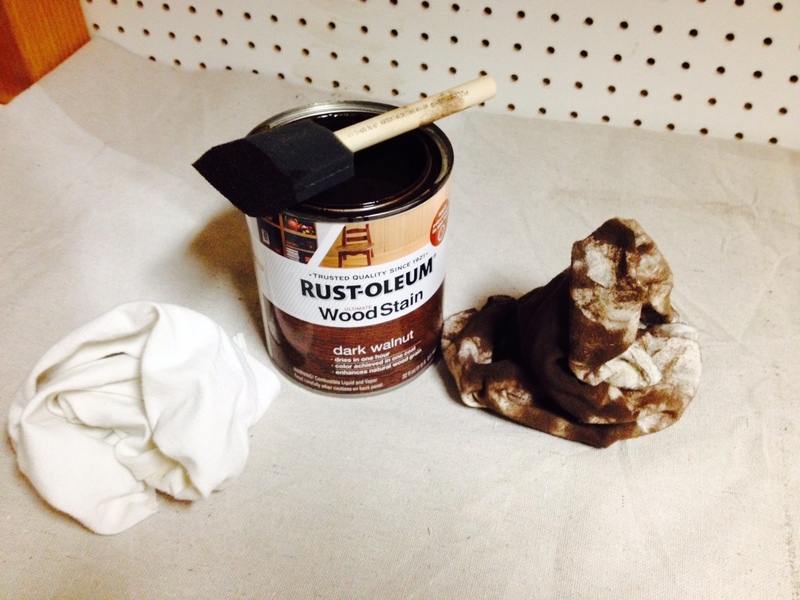 With a paint brush liberally apply polyurethane on all surfaces. Allow to dry overnight. Sand and reapply. Do as many layers as desired, we did 3, but could have easily done 4-5 because the poly gives such a smooth, professional finish. That Dad Dominic Tip /// Don’t use foam brushes with polyurethane. Paint brushes work much better because a foam brush will leave bubbles behind with each stroke; bubbles + poly = crappy product. Paint brushes alleviate this problem. That Dad Dominic Tip /// Sand between each poly application with the wire balls. 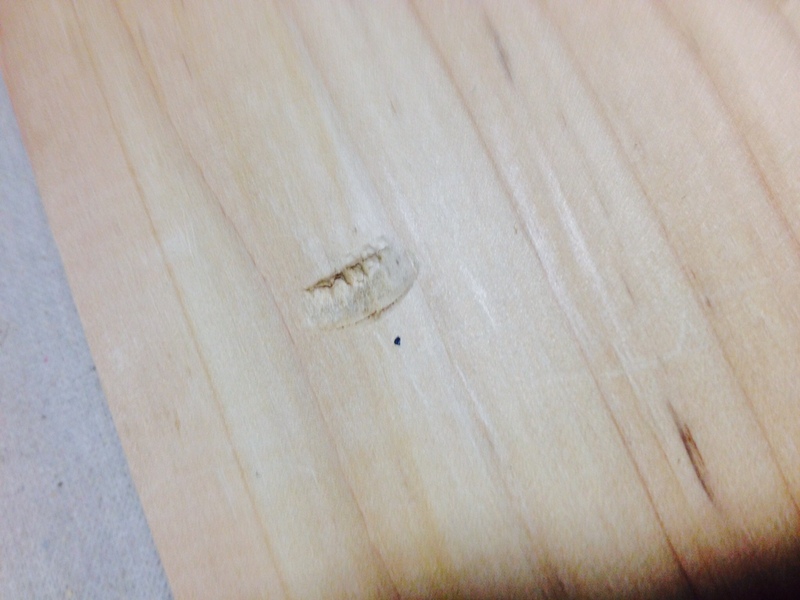 I don’t like using even fine sand paper because it is too abrasive for poly. 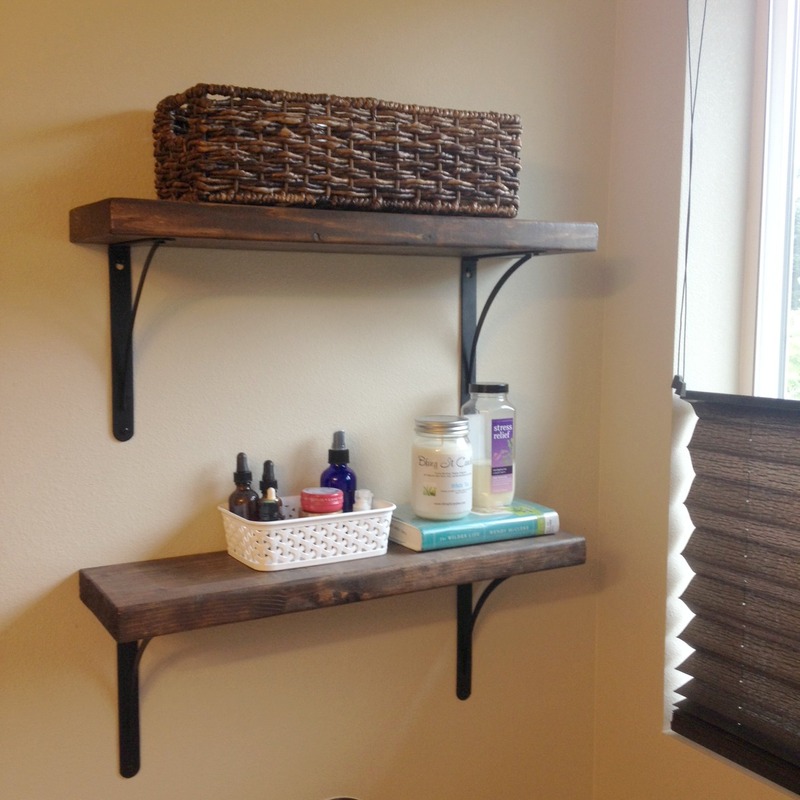 Once completely dried, it’s time to install your new shelves! 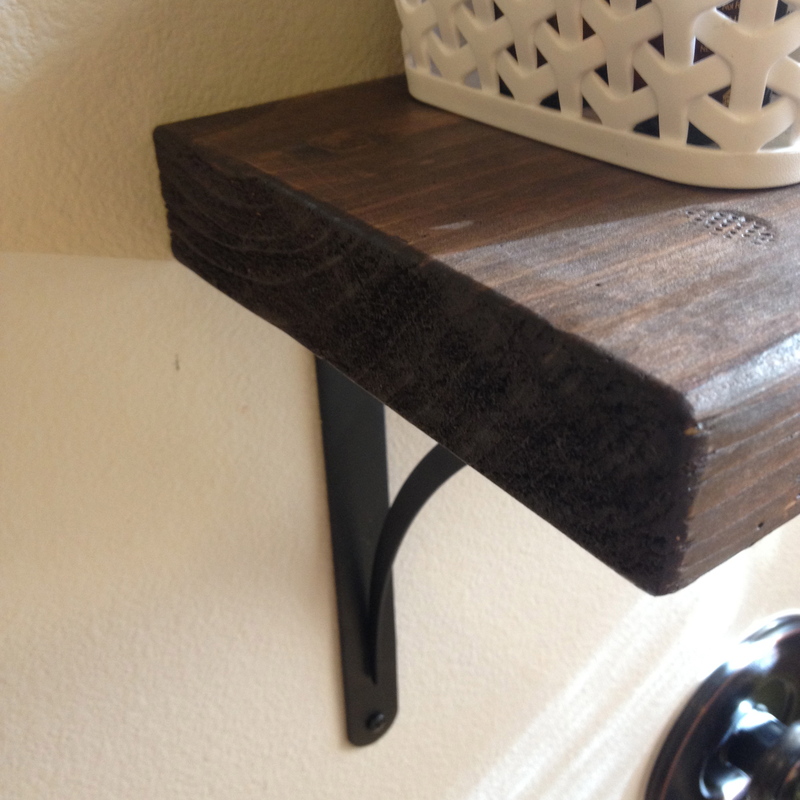 We used decorative brackets from our local home center. When the shelves initially went in, I had a beautiful orchid. It has since lost its flowers and I failed to help it re-bloom. As least my husband and children are fed and well, right? 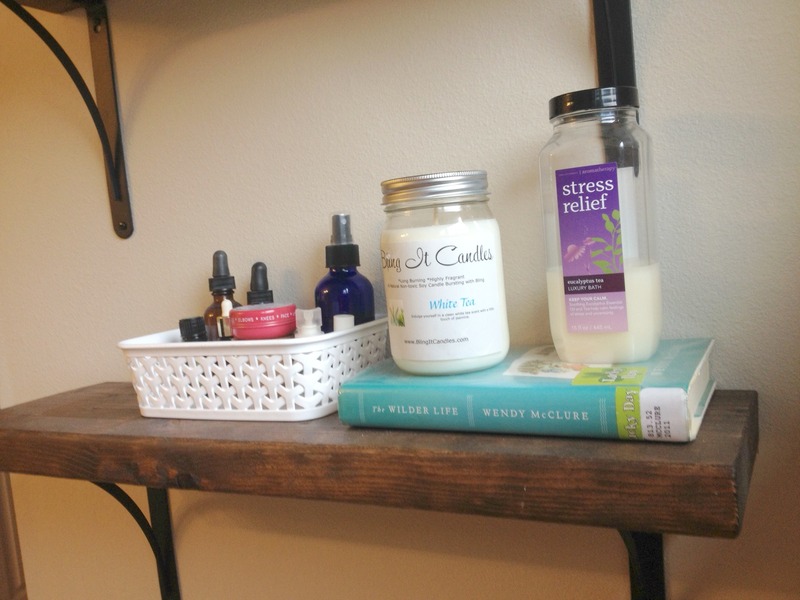 These shelves are the perfect addition to my bathroom oasis. Which could also read as, a safe place for my mama stuff that shouldn’t be mixed up with bath crayons and princess floats . Thanks you, Dominic, for entertaining all my Pinterest dreams – you’re the best! Happy Father’s Day! The Story About Baby Four's "Nursery"